Great news! All five volumes of Secrets of the Universe are back in print, in paperback, for reasonable prices. You can find and order individual volumes or the entire set from Living Book Press They should also be available through your local bookstore, or from online booksellers. Tanglers is Back in Print! 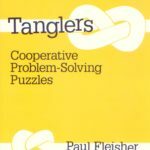 Tanglers is Back in Print! I’ve had a number of requests to make this widely used classroom resource available, and so… The newest edition is now available through booksellers, including Amazon.com You can also order a copy from me directly. Email me for details. Directions: To solve the puzzle, use each syllable once and only once to reassemble 20 science words, with no syllables left over. Help each other! Download: STEM puzzle (as .doc) STEM puzzle (as .pdf) Answer Key….Don’t peek!! !